The Volvo S90 Momentum Trim: What Does It Offer? There are many luxury sedans that consumers have to choose from, but the Volvo S90 Momentum trim is an exceptional model. Our staff at Bill Kidd's Volvo Cars serving Cockeysville always take the time to understand our models so that consumers can make an informed choice about their purchase. 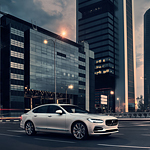 Learn more about the Volvo S90 Momentum trim below. Are you looking for a luxury sedan that provides your rear seat drivers with enhanced comfort? If so, the Volvo S90 Momentum trim comes with 4.5 more inches of leg room than its rivals, such as the Mercedes-Benz E-Class, the BMW 5-Series, and the Audi A6. With the extra leg room, your passengers won't ever have to feel uncomfortable. The S90 Momentum trim also offers an impressive powertrain. The turbocharged and supercharged Drive-E powertrain engine can reach 316 horsepower. In addition, this engine also increases fuel efficiency and reduces CO2 emissions so that you have a positive impact on the environment.